Exchange money with friends for FREE! Payments are simple, social, and secure! Open a tipping bucket for a birthday gift and share it with your friends and family. Collect contributions for parties, weddings, sport clubs, fundraisers, or any other event. Imagine giving PayPal's "Donate" button a social makeover. That's what we did! Whatever the cause or need may be, TippingCircle helps you raise money through a social help network of friends, family, and others who care about you and your cause. Create your first tipping bucket today! TippingCircle socially empowers your PayPal account. We've created a social payment network that makes it simple and usually FREE to exchange money with friends, family, and anyone with an email address. Establish your own social payment profile by using our apps to send mobile payments with friends, split bills, setup group payments, give gifts, and support tipping buckets. 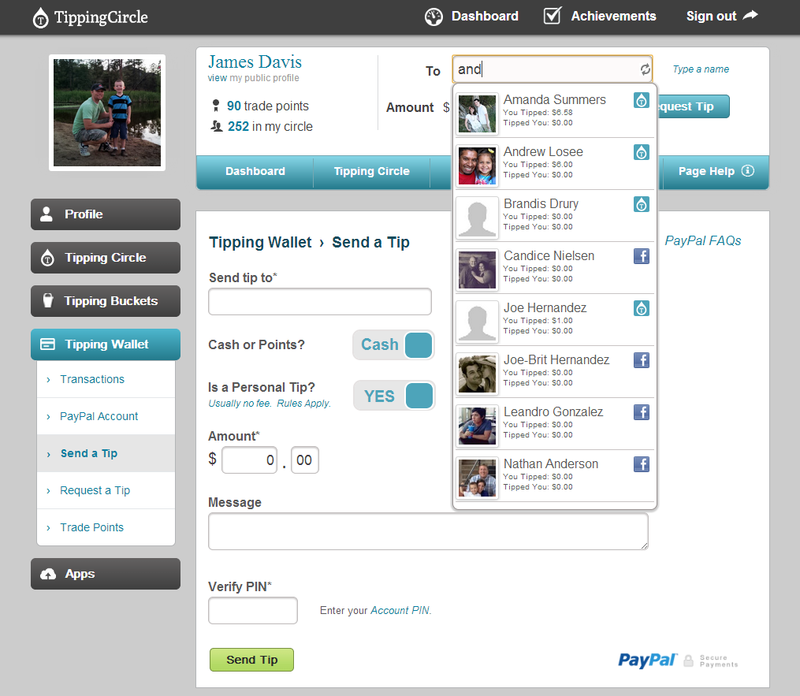 TippingCircle connects with popular social networks and PayPal. Whether you are repaying a friend for lunch, tipping someone who helped you, or donating to a tipping bucket, you can connect your personal payments with your social network. When your friend brings you dinner after you've had a hard day, your Facebook friends and Twitter followers can know about it when you send a tip to say thanks. Spread your call for help. Tipping buckets hold payment contributions and are shared through social networking. Anyone can open a tipping bucket to raise money for a good cause like to help pay for medical bills, assist a neighbor in need, help fund a funeral, raise funds for a non-profit organization, help a student pay for college, and the list goes on. . . The social connections in your tipping circle are your social help network. When you open a tipping bucket, the members of your tipping circle are notified and can contribute to your bucket and share it with their social network to support your cause. 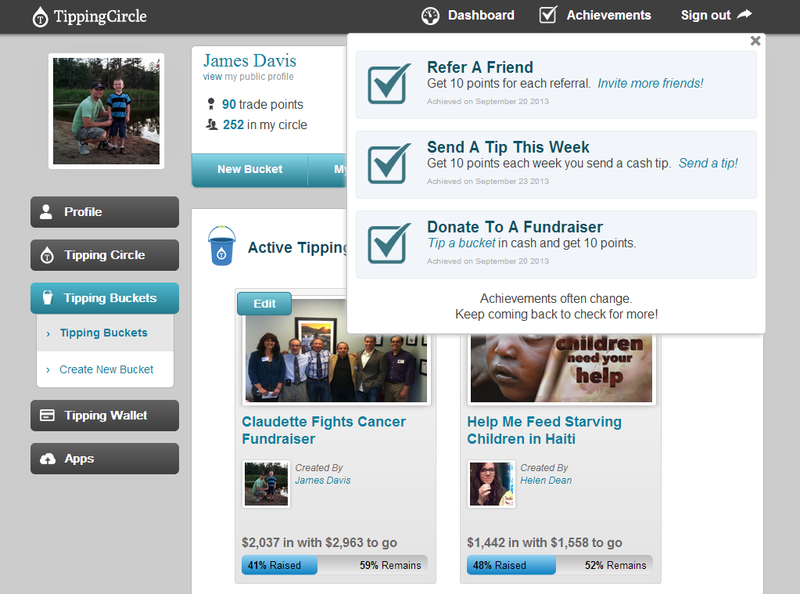 The best way to fund raise is to use TippingCircle's social help network. 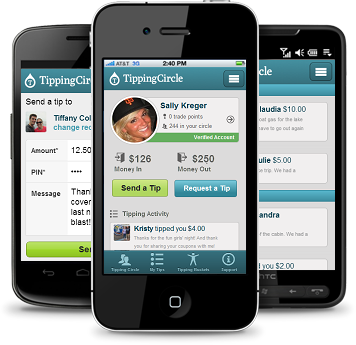 TippingCircle is a software service that enables people around the globe to send and receive personal payments with their social connections. The TippingCircle software and services is owned and operated by InovaCode, Inc.
We do not sell, trade, or transfer your personally identifiable information. We also do not tolerate illegal, immoral, or drug-related motives for raising money. I noticed TippingCircle on my friend's Facebook page when she donated to a tipping bucket. I owed my sister $10 at the time, so I signed up and sent her a tip. I love it and I'm getting my friends to use it! I wanted to get my dad a new golf set for his birthday but I didn't have that kind of money. I opened a tipping bucket and shared it with my brother and sisters. They all contributed and even a few of my friends did too! TippingCircle is a great service, keep up the good work! Our web app is designed for tablets and can be used on any modern computer with an internet connection. We have also released a free mobile web app that can be accessed by coming to our website on a mobile device. 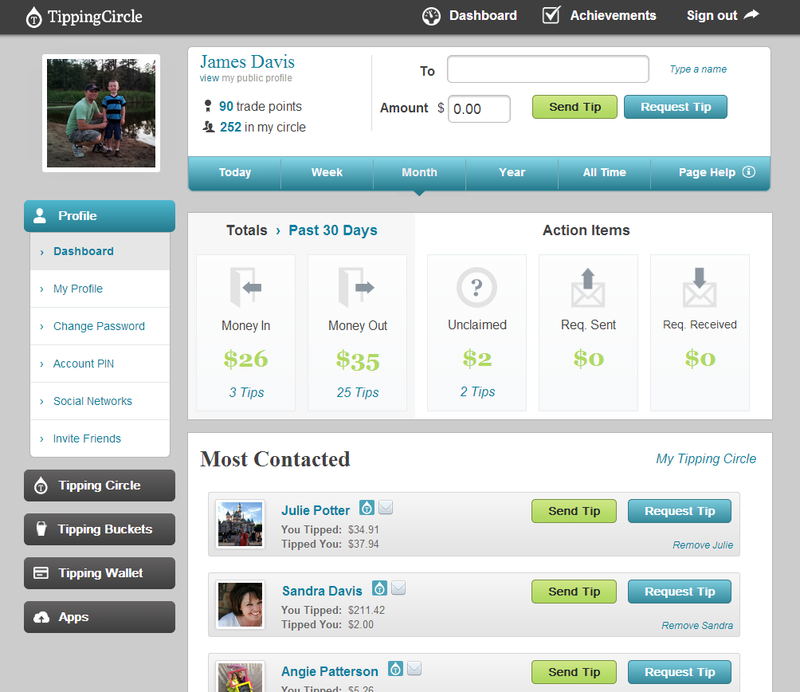 Do I need a TippingCircle account to accept a tip? Nope. If the person sending you a tip has your email address, the money is sent directly to your PayPal account. If the tip sender doesn't know your email address, then you will be contacted through your social connection . . .
My PayPal account cannot accept payments. Following these steps should help you resolve this issue . . .